The Alexanders seemed content to settle at Latrobe Terrace, in Chilwell, only a short distance from where they landed at Geelong. They lived there for at least eight years, and this is where Isabella, Margaret, James, John, and Robert were born. The family resisted the immediate lure of the goldfields and instead capitalised on the demand for tradesmen to service the booming economy of Victoria. Perhaps William Alexander made tools, carts, barrows or wagons for the endless stream of immigrants heading west to Ballarat. Or perhaps he erected dwellings for the influx of arrivals. As William's sons grew to working age, they were all described at some stage as carpenters, blacksmiths or implement makers. They each had marketable skills. After Robert's birth, the family followed the population moving to the goldfields. In 1864 the last child and subject of our story, Charles Boyd Alexander, was born at Ballarat. A dark cloud of silence descends on the family in this period, but before 1883 the family left Ballarat for Nhill, in the Wimmera district. On 24 February 1885, father William was committed to the Ararat Lunatic Asylum, halfway between Ballarat and Nhill. It was a sad but inevitable sentence, and something the family never spoke about. It scarred the family and determined their destiny. Their father's 'condition' is the most likely reason that marriage, in their minds, was out of the question. This didn't deter Margaret, who married in 1883 and John who married in 1892. With this act of defiance, both were effectively cut off from the family. William died in the asylum almost two years after he was admitted, aged about 69, and was buried locally at Ararat. For the Alexander family, another chapter had closed and new opportunities were beckoning. They were about to make their fortune. 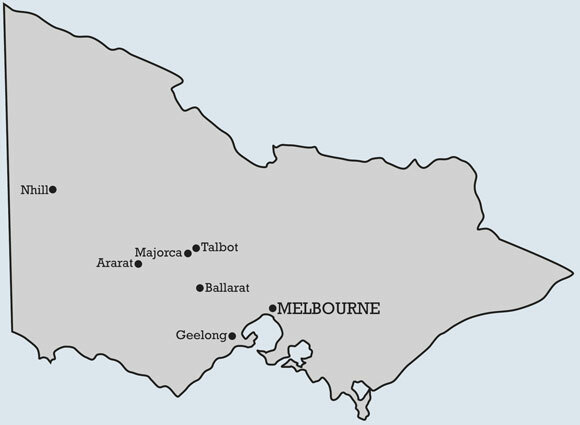 Above: Map of the localities that featured in the Alexander family's time in Victoria (1852-1904).